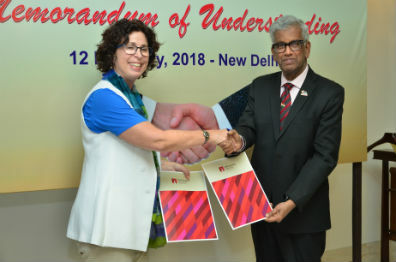 New Delhi, March 6, 2018: Macquarie University, one of Australia’s top 10 Universities has today signed a Memorandum of Understanding (MoU) with Broadband India Forum (BIF) and O P Jindal Global University (JGU) to collaborate over a wide range of academic and research activities and initiatives. The collaboration with Broadband India Forum (BIF), a dedicated institution set up to expand broadband thought leadership in India and Macquarie University focuses on cyber security and business ethics. This collaboration will also include joint research, publications, staff exchange and internships for Macquarie University students. Research is on high priority for both institutions and the focus will revolve around spectrum management (5G), wireless and telecommunication, IoT and cyber security. The MoU was signed in the presence of Ms Nicole Brigg, Pro Vice-Chancellor (International), Macquarie University and Mr. T. V. Ramachandran, President, Broadband India Forum. Speaking on MU’s partnership with BIF, Ms Nicole Brigg, Pro Vice-Chancellor (International), Macquarie University said, “Macquarie University is a research intensive university and it is at our core to partner with thought leaders in priority countries such as India. Broadband India Forum’s research aligns well with Macquarie’s Faculty of Science and Engineering particularly in the areas involving telecommunications where Macquarie has established itself as a world leader. We look forward to the exchange of ideas and experts with BIF and hope the relationship will also benefit Macquarie’s existing students who may have an opportunity to undertake an internship in India through this partnership”. The collaboration with O P Jindal Global University (JGU), a non-profit global university recognised by the University Grants Commission (UGC) and Macquarie University focuses on articulation, exchange and research partnership. The main focus of the partnership is to develop closer ties between the business and management faculty at both institutions and bring them together to deliver joint lectures, conferences, short term programs and workshops. The MoU was signed in the presence of Professor Stephen Brammer, Executive Dean, Faculty of Business and Economics, Macquarie University and Prof. C. Raj Kumar, Founding Vice-Chancellor, OP Jindal Global University. After the MoU signing JGU and Macquarie University held a joint conference titled ‘Business, Law and Ethics: Conflict or Coherence’ where Professor Brammer, Executive Dean, Faculty of Business and Economics gave a talk on ‘Successfully implementing sustainable supply chains globally and Professor Philomena Leung, Associate Dean, International & Corporate Engagement Faculty of Business and Economics talked about ‘Conscience of AI’. Speaking on MU’s partnership with JGU, Professor Stephen Brammer, Executive Dean, Faculty of Business and Economics, Macquarie University said, “O P Jindal Global University is a strategic partner for Macquarie University, mainly for its Faculty of Business and Economics. There are various areas of synergy between the two universities and we are looking forward to building a robust partnership. We are fortunate to have Macquarie champions at O P Jindal University as Professors who we expect will be the conduit between the two partners. Our immediate goal is to establish research links and encourage staff and student exchange between the two universities”.